The significance of this finding is that it pushes the existence of leprosy back by 2,000 years, from biblical times, with physical evidence. 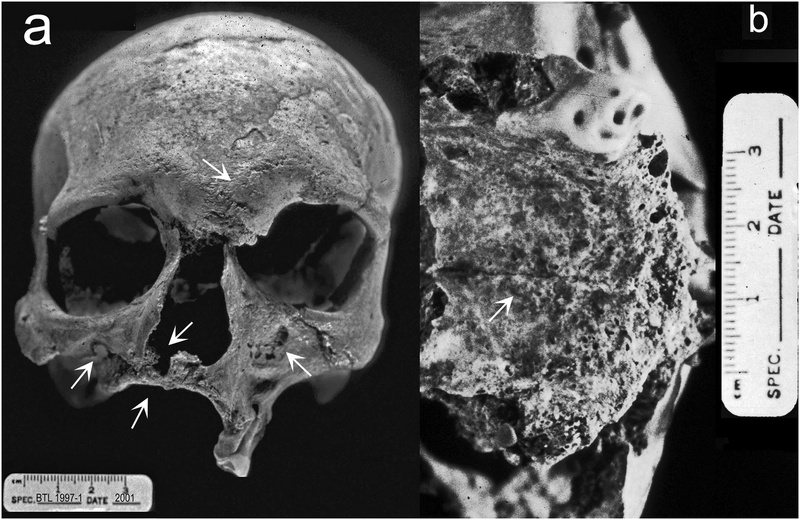 These are all characteristics of leprosy, treponemal infection, leishmaniasis, sinus and oral infections, tuberculosis, osteomyelitis and non-specific infection in the post-crania. But differential diagnosis ruled out all of the other pathologies other than leprosy. The individual was excavated between 1994–1997. Lots of hallmarks in human existence occurred during this time period, some being inventions in system of writing, standardized weights and measures, monumental architecture, and trade networks that stretched to Mesopotamia and beyond. While the pathophysiology of leprosy is up in the air, it is not surprising that communicable diseases, even not very contagious ones like leprosy, also blossomed during the rapid sedentarisation of human populations. Leprosy is a granulomatous (nodule) disease of the peripheral nerves and upper respiratory tract mucosa, caused by immune system unsuccessfully trying to sequester the infectious bacterium Mycobacterium leprae and Mycobacterium lepromatosis. Unlike popular belief, body parts falling off is not the primary symptom of leprosy, but rather skin lesions are the main external manifestation of the disease. The damage to the nerves affects blood flow and ultimately causes necrosis of tissue, which happens in during the advanced lepromatous stages. What is curious is that descriptions of leprosy have been noted in Ebers papyrus, an Egyptian medical document and the Atharva Veda, a Sanskrit holy text, which both refer to the disease as early as 1,550 B.C., a few hundred years after this individual died. I wonder if this guy was one of the first Lepers then? Gwen Robbins, first author of the publication, expressed interest in recovering DNA from the Mycobacterium leprae and comparing it to strains common in Africa, Asia and Europe today in order to shed additional light on the origin and transmission routes of this disease, in fact she hypothesized that the disease migrated to the subcontinent from Africa, at a time when substantial interaction among populations throughout Asia, the Middle East, and Africa. 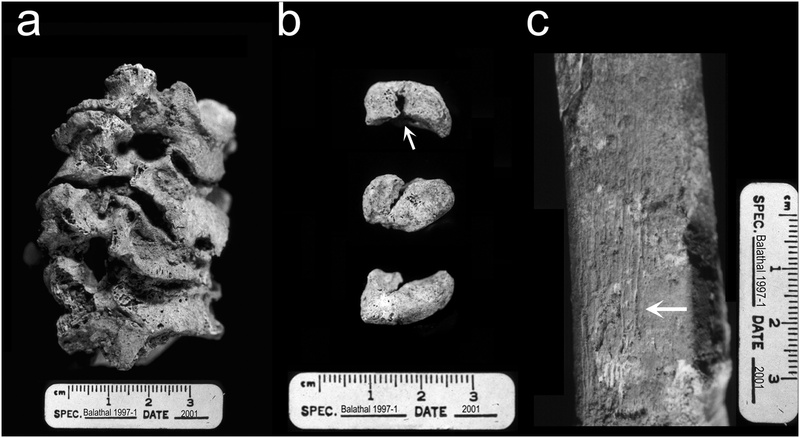 Elements demonstrating pathological conditions in the postcranial skeleton of individual 1997-1.